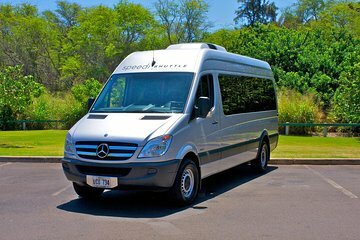 Viator is always a great way to get from Kauai Airport to hotels in Kauai. Always on time, friendly drivers and very affordable. We booked this service for our arrival and departure. Flora our driver was there to greet us when we arrived. She drove us to Poipu and she was super friendly! For our departure, she arrived to our condo right on time and again very pleasant to talk to! I highly recommend this service if you go to Kauai, its easy and very reasonably priced. We will use them again for sure! My driver was super friendly and arrived slightly earlier at my hotel than arranged pickup which suited me as I like to ensure i'm at the airport with more than enough time to spare with checking in and security. Everything was fine. On time, pleasant driver. Good driver and good car. It arrived 25 min late, but I got my flight. Good value and nice accommodations. Be very careful about the fineprint it say you should be there about 15 minutes before scheduled pick up time - mine was scheduled for 10:45 and my driver arrived at 10:30. I didn't mind and I was the only customer so I got a private transport. It all worked out very well. The shuttle arrived right on time. Flora, the driver, was so accommodating and kind. I was the only passenger in the shuttle, so couldn't ask for anything more. Flora gave me good instructions on how to navigate Agriculture Inspection, check-in area, check baggage area and security. I would recommend this company. Pick up was brought forward to include other passengers who needed to go early. Consequently, we had to wait a few hours at the airport for our flight. Comfort ok. Driver ok.